640: This week we go up to the coast to play Ocean Dunes Golf Links in Florence, OR. 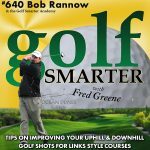 Our guest is Bob Rannow, PGA, a native of Oregon who has been teaching and working in his home state since he was 14. Bob gives us an overview of Oregon coastal courses and get a TeeTour of Ocean Dunes Golf Links. The second half of our conversation covers his tournament history and tips and insights to play better at links style courses. If you’d like to see photos of Ocean Dunes, there’s a video from the first part of our conversation on our GolfSmarterTV channel. Previous articleBandon Dunes Should Be On Your Golf Bucket List, But There’s More in Oregon!